Our planet is known as the green planet; because it contains large varieties of plant kingdom of all type of trees to fungi. Primary needs of living beings including food, air, and water all exist in nature. The balance of nature depends on plants and hence they are inevitable for life. Plants are being helpful in various ways in our daily life. Some of them are planting for fruits, grains, seeds etc., plants can fulfill almost all our food needs in our daily life, and plants are widely used to prepare herbal medicines like Ayurveda, Homeopathy, Unani, Sidha etc. It is also used in cosmetic treatments, the other products like wood is used to make furniture and firewood as an energy source, some of the modern medicines are also depending herbal plant for their extract to prepare medicines. Plants can control gaseous conditions of atmosphere to balance the climate. They are capable of clean the air by photosynthesis. Plants keep the soil fertile, its roots prevent soil erosion, decayed leafs keeps the soil spongy and wet which is helpful to maintain the soil fertile and increase water availability.Animals and birds are getting shelter and food from trees. The list is longing. So we can say nature is gifted by God to both mankind and animal. the existence of life depends on nature. Even though we know all the things, men are engaged in a massive exploitation of these resources for his business needs leading to the degradation of nature. Over consumption or greedy exploitation leads to damage of some kind of plants and other resources, then naturally nature reacts against men for his deeds. It causes including climatic changes, epidemics, droughts, heavy windfalls are examples for this natural degradation. Now ground water gets reduced, rivers and springs get destroyed and thereby making precious herbal plants are getting extinct, creating new borne diseases. So we have to take a great care about the matters to maintain this biological balance of the resources for the peaceful co-existence of living beings. According to Bible, disobedience creates sins and sins create diseases and diseases create death to the world. But for the mankind the almighty had created remedies too for these problems through herbs. According to the Hindu mythology, Nature is god and it teaches men its importance for existence. Indian wealthy culture of temples associated with ponds and sacred groves or pocket forests are examples for this. It is better for us to follow the goodness of our forefathers who loved and maintained nature by not harming it. Our earth consists of about 2, 50,000 plant species, more than 80,000 species have at least some medicinal value and around 5000 species of plants have been specific therapeutic value. India is the richest medicinal plant resource in the world, about 2000 variety of medicinal plants have been identified with a high potential medicinal value. W.H.O reveals that a huge number of the rural area population still relies on traditional treatment with herbal plants for their physical and psychological treatment needs. In sub-continent, plants have been the major sources of drugs for medical therapy. Almost all plants in the nature having a significance of its own, some of them are edible, some are aromatic, some are poisonous and most of them have medicinal value. We can see animals also using herbs of their own method to cure some illness. In ancient times men had been used herbal plants to prepare medicines to cure their illness; According to Ayurveda this alternative practice of medication may start more than 5000 years ago. ‘Ayur’-life, Veda means Science or knowledge. 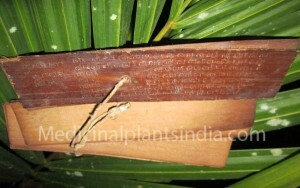 Herbal plants are the backbone of Ayurveda. We have the evidence that herbal plants had been used as medicine, it had been written as scripts on stones and palm leaves, etc. In ancient classical Ayurvedic texts like ‘Charaka Samhita’, ‘Susruta Samhita’ and ‘Astanga Hridaya Samhita’ have mentioned a huge list of medicinal plants and its uses.